For more than 130 years, Vaillant has set the standards in the heating market, creating products that have revolutionised the industry. As Europe's number 1 boiler manufacturer, innovation still comes as second nature. Our products boast the highest energy efficiency ratings and lowest emissions, and come with an enviable reputation for performance, quality and reliability. 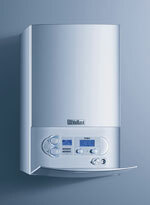 At the moment we install 'ecoTEC' Vaillant wall hung domestic boilers and Grant UK Boilers. High efficiency or condensing boilers (they are the same thing) have a heat exchanger that uses heat in the flue gasses to pre-heat the water. (They are called condensing boilers because most of the heat recovered comes from condensing water vapour in the flue gasses.) The condensed water is drained away and much less energy is required to raise the temperatureof the preheated circulating water to the desired level. Vaillant SEDBUK‘A’ rated boilers in the ecoTEC range operate with an annual average efficiency of over 90%*. Typically, older types of conventional boilers only achieve efficiencies of 56%*. That means your condensing boiler will use 35% less energy to deliver heating and hot water to your home. This is how a condensing boiler can save as much as 35p in every £1* you spend on energy. This can amount to a saving of over £240* on your annual home heating bill. Coleman Plumbing and Heating carry out regular servicing to all boilers. Contact us for a quote today to save money on future bills!